Like any girl I love a good wish-list, and mine are forever changing. This month's wishlist contains a bit of everything, from budget friendly pieces to high end. Anastasia Beverly Hills - These products are amazing! I already have the brow pomade and powder contour kit. I would love to add the cream contour and new highlighter to my make up collection. Stuart Weitzman - I think every girl would love a pair of these gorgeous over the knee boots. For now I have my Penneys pair which are serving me well. Celine - This brand can do no wrong. I tried on a pair of oversized Celine sunglasses and fell in love. I think they could be worn with anything. YSL - How gorgeous is this vintage inspired YSL pendant necklace? I could see this becoming a wardrobe staple, another piece to add to my YSL collection. Calvin Klein - I got one of the CK crop tops for Christmas last year, I would love a casual tee to add to my wardrobe. Chanel - I'm aware these runners are long sold out, but aren't they amazing? I'm a big fan of comfort when I'm dressing casually - and these runners would be the perfect way to add some low key luxury to any outfit. Of course the Chanel Boy bag goes without saying, that gold detailing though! What's on your wishlist for Christmas? 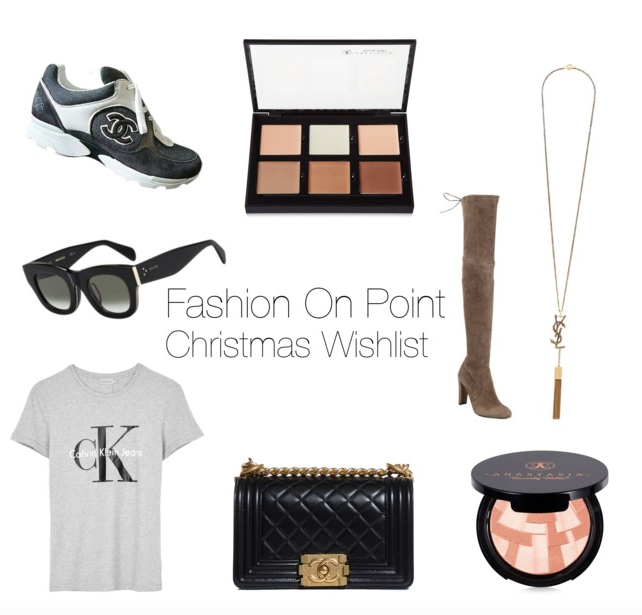 2 comments on "Christmas Wishlist - Celine, Chanel, Calvin Klein"